Everyone wants his/her application to be beautiful and attractive for an eye of a user. And there are a lot of applications, at least desktop applications, mostly games that use splash screens. It’s nice and, moreover, while the splash screen is working, you can initialize your application. Many tutorials exist explaining how to begin Android programming and I won’t repeat them here. You can find them all over the internet. So I will show only the programming stuff. Here the gravity attribute value is set to “center” to make the splash to be at the center of the screen. Add some picture to the appfolder/res/drawable folder and press F5 on the project. I’ve added lnxins.png and as you can see, set it as the image view source. So far, let’s look at the application manifest. It has now just one “.MainActivity” activity set as a launcher. We’ll set it as default category and add another splash activity with a splash layout and will set it as the launcher. Open the manifest and open an application tab. For the main activity, change an Android intent category to default. Near application nodes press an “Add…” button, choose create a new element at top level and double click on Activity. For new activity, click on a “Name*” hyperlink and enter “SplashScreen” class. In sources, a new class will be added for the splash activity. Next, press the “Add…” button again for the SplashScreen node and add the intent filter. Again, for just added intent filter, add an action and a category. It’s time now to make a first run. And we have the splash screen waiting for 5 seconds. Doesn’t look good, just two black screens, one after another. 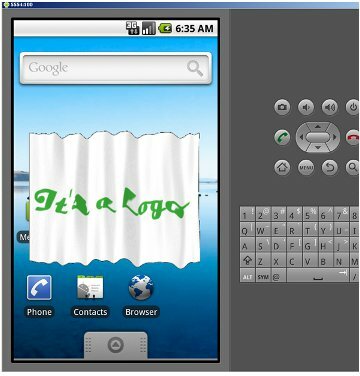 Here are some explanations: as you can see, the style’s parent is android:Theme so we could apply it to our activity. And as you can see, the attribute’s names are clear and you can understand what they mean. Run it. Looks better. Now we’ll make it fade-in and fade-out. Create in appfolder/res folder new folder “anim” and add to it two Android XML files – appear.xml and disappear.xml. They will be alpha animations. That’s all. Have fun with Android programming.